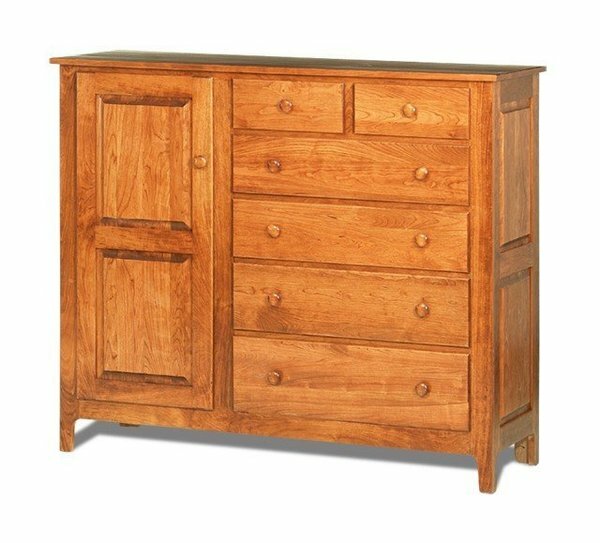 This Amish handcrafted Shaker Mule Chest features six drawers and a large cabinet door with two adjustable shelves for plenty of storage space. This Amish mule chest offers a contemporary but classic look for the bedroom. Please call to speak to one of our furniture specialists with questions or ordering assistance on our Amish bedroom furniture. This chest of drawers has beautiful raised panel sides, wooden Shaker hardware, dust covers between drawers and dovetailed drawers. Please allow six to twelve weeks for this to be built. After an order is placed we send out stain samples to confirm your stain or paint selection. If you ordered online, these samples should arrive one week after the order was placed. We are happy to work with customers on customizing our furniture. We can also do stain matching and custom woods such as Tiger Maple Wood.